As we know that large fishes are found generally in Saltwater. But, the Saltwater lakes, rivers and oceans is not the only place where behemoth fishes can be found. In fact, Gigantic fishes swim even in freshwater around the world, However many of them migrate between marine and fresh waters. Hidden beneath the murky water of freshwater rivers and lakes, there are some fishes that grow to mammoth sizes. Here is the list of top ten biggest, largest freshwater fishes in the world. The beluga sturgeon is the largest sturgeon and one of the largest bony fishes in the world. It is one of the largest predatory fishes on Earth and also one of the only species of sturgeons that actively eat other fishes. Reaching lengths of 24 feet and weighing more than 3500 pounds, beluga sturgeon has a life cycle similar to that of salmons. Also, it always hatches in freshwater rivers and spends most of its adult life in saltwater seas. But, unlike the salmons, beluga sturgeon reproduce year after year. One interesting thing to note is that these species are harmless and actively avoids people. The eggs of the beluga sturgeon are a rare type of caviar known for the delicate skin, however, due to the endangered status of the species, the caviar is banned in the United States. The largest captured beluga sturgeon is of size 20 feet and weighs over 7,000 pounds. According to the Convention on International Trade in Endangered Species, the species is threatened with extinction, however, the quotas are still unchanged since 2007. According to the Pew Institute for Ocean Science that analyses quotas every year that are reset every year has confirmed that beluga caviar quotas are virtually unchanged and that needs to be changed. White Sturgeon is an anadromous fish species, found mostly in the Eastern Pacific region and the Gulf of Alaska to Monterey, California. White sturgeon are the largest freshwater fishes in North America and also one of the largest freshwater fishes in the world, weight 1,500 pounds. Moreover, the growth of white sturgeon is very slow and usually matures in eight to 20 years, depending on the environment. Also, it can produce 100,000 to four million eggs per spawning, but they spawn only once every two to eight years. The species existed since prehistoric times, however, there is a major decline in the population because of the demand for caviar increases throughout the world. According to the data of IUCN, 85% of the Sturgeon are at the risk of extinction. Soon the existence of one of the largest fishes in the world will end. The official status of White Sturgeon as per the United States Department of agriculture is endangered that means all the species are in danger of extinction. The spend some time of their life at sea and later ascend to the seas. According to the USDA, the current numbers are limited to 168 miles in the Kootenai River measured from upstream of Cora Linn Dam in British Columbia to Kootenai Falls. The giant freshwater stingray is a species of stingray belonging to the family Dasyatidae. It is found in most commonly in large rivers and estuaries of Indochina and Borneo. Though, it is more widely distributed in South and Southeast Asia. Being, one of the largest freshwater fish in the world, this species grows up to 1.9 metres long and can weight 600 kg. However, this species is uniformly greyish brown from above and white from below. However, locals have claimed that they have seen even bigger specimens of these fishes. The species were mostly seen in estuaries and large deep rivers hidden over sandy river bottoms. They are just waiting for the crabs, fishes and crabs with the help of the sensor that can easily detect an animal’s electrical field. Mekong Giant is one of the largest freshwater fishes ever to be found on the planet belonging to the shark catfish family. This Mekong Catfish is a large and critically endangered species of catfish, endemic to the Mekong basin in Southeast Asia and adjacent China. This gentle giant grows very fast in size and can reach from 330 to 440 pounds in just six years. In 2005, a record-breaking specimen was caught in the Mekong River in Thailand where the giant fish was nearly nine feet long and weighed in at a whopping 646 pounds was caught. The species is grey-white in colour and can be differentiated by the lack of barbels and absence of teeth. It is one of the largest migratory fishes in the world that used to travel huge distances to spawn. The population of the fishes seen in Thailand, Cambodia, Vietnam and Myanmar, however, they are most common in Thai-Lao PDR border. There is a major decline in the population of one of the biggest fishes in the world around 90%, however, there are no estimates because its totally depend on the specimens caught. The species is critically endangered according to the WWF Report Highlighting Dangers of Damming the Mekong. It is also said that the population of the species will be driven to the extinction if the govertment agencies will plan a dam for the Mekong River. There are four giant fish species lives in in the Mekong river and listed as one of the largest freswater species in the world. One of the largest freshwater fishes, Alligator Gar, often known as the “fossil fish” or “primitive fish,” is one the largest freshwater fishes in the world. Alligator Gar is an extremely old fish species dating back to over 100 million years ago. It is generally a slow-moving animal that has bone-like scales with a diamond shape. Alligator gar can grow up to 10 feet long, can weigh up to 300 pounds and can live up to 50 years. However, alligator gars are harmless and do not pose any threat to humans. They tend to be aggressive hunters of their prey, feeding on mostly small fish, as well as small mammals and insects. The species population is on a major decline since the mid-twentieth century. The primary reasons are the construction of dams and dykes that have eliminated floodplain habitat where they usually spawn. Since late 1990’s efforts are being made to reintroduce alligator gar in their natural habitats in several West Tennessee Rivers. Arapaima is the largest freshwater fish in South America and also one of the largest freshwater fishes in the world. Arapaima can grow to over eight feet long and weigh more than 400 pounds. It feeds on other fish species and sometimes it can even jump out of the water to grab a snack like a bird or small land mammal. Also, this fish can breathe air and stay submerged for 15-20 minutes at a time and can also survive up to 24 hours outside of the water, however, these species are listed as endangered species by Convention on International Trade of Endangered Species or cite. The trade of one of the largest fishes is highly prohibited. Bull sharks usually live near high-population areas such as tropical shorelines. They are medium-size sharks, with thick, stout bodies and long pectoral fins. Many experts consider bull sharks to be the most dangerous sharks in the world because they are very aggressive and human bothered. Historically, a bull shark with its two other species namely, great whites and tiger sharks can prove to be very dangerous as all of the three species mostly attack humans. The species aren’t at all bothered by brackish and can swim far between rivers and tributaries. Historically, they are closely related to great whites and tiger sharks and one of the three species likely to attack humans. The species can at everything they see including fish, dolphins and other sharks as well. There are instances where they have attacked humans out of curiosity. Bull Shark is considered as near threatened as per the reports from the IUCN. The primary reason for the threatening status will be fishing & harvesting aquatic resources. The population thrives in Marine and Supratidal wetlands. The taimen is a species of fish belonging to the salmon family of order Salmoniformes. These fish are commonly found in Siberia and also in freshwater rivers and lakes of Russia, Mongolia and Central Asia. It is the largest species in the salmon family which can grow to over six feet in length. Also, they are known to gulp up creatures like rodents and birds, and that is why they have been called the “Mongolian Terror Trout” by National Geography. The species are mostly seen on the Japanese Island of Hokkaido, Kuril Islands, Russia’s Sakhalin and mainland areas of Russia, Mongolia, China, and the Korean peninsula. According to the International Union for Conservation of Nature (IUCN), the status of the species vary between vulnerable to critically endangered. The Paddlefish is a member of the Paddlefish family, which is one of the most primitive groups of fishes in North America. 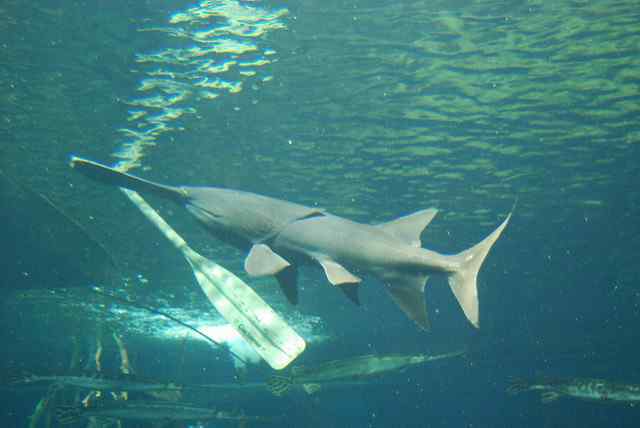 The Paddlefish is generally Long, has a spatula-like snout that is longer than the remainder of the head. Also, it can grow up to 2 metres long and weigh over 70 kilograms. Sometimes, they have been referred to as “primitive fish” because they have evolved with few morphological changes since the earliest fossil records of the Late Cretaceous, seventy to seventy-five million years ago. The species resembles sharks both by the shape and skeletons. Both of them have skeletons made of cartilage and not bone. It does not have any scales on the body, however, gill cover is long and have tiny eyes. The species loves to thrive in large rivers or reservoirs, usually in water deeper than four feet. It is the oldest surviving animal species in North America. The Nile perch is a species of freshwater fish belonging to the fish family Latidae of order Perciformes. It is widespread throughout Afrotropic ecozone, being endemic to the Congo, Nile, Senegal, Niger and Lake Chad, Volta, Lake Turkana, and other river basins. The Nile perch is a fish of substantial economic and food-security importance in East Africa that also occurs in the brackish waters of Lake Maryut in Egypt. This giant species can grow up to 6 feet and weighs more than 500 pounds. These species are often seen in the Nile, Chad, Senegal, Volta and Congo river basins. Talking about the appearance, it has black eyes with a blue tinge and bright yellow outer rings. It generally prefers warm tropical waters and female fishes are larger than the males. It loves to eat insects, crustaceans, molluscs and fish and can eat even bigger size when they grow bigger. These are the largest freshwater fishes in the freshwater. Do post your comments.